After two and a half years, my Amazon Kindle Keyboard 3G has bitten the dust. Even following a factory reset, page turns beyond the first couple of minutes reading are too much for it and the power switch is also faulty. A couple of years isn't necessarily a bad lifespan for a piece of modern mobile technology. We are encouraged to change our phones every two years and relentless upgrade cycles, backed up with big marketing campaigns, pester us into believing that our gadgets are completely obsolete to the point of embarrassment mere months after we swiped our credit-cards. Once you own an Amazon Kindle, book reading remains an affordable and lovely hobby to have. The Kindle daily deal offers big titles for 99p, the classic literature is often free and chart titles are often half the price that the high-street will sell you the dead tree version for. Coupled with the convenience of having your entire collection with you in one device and the ability to sync across to Kindle apps on other devices like your smartphone - I've never felt the need to complain about the initial upfront cost. My Kindle 3G cost £149 at the beginning of 2011. Just 2.5 years later and I've had to replace it with a £113 spend on a Kindle PaperWhite (including a cover) so that I can continue to use my book collection. Whilst I'm still enjoying the conveniences of the Amazon e-book ecosystem, I will no longer argue that it's cheap, but three years is a long time in technology and it interested me to find out whether the second generation of the PaperWhite was a decent 'upgrade' over my Keyboard 3G. The first and most obvious change is that the physical keyboard has gone and instead, the whole of the front of the Paperwhite is dominated by a touchscreen version of the e-ink based screen. It looks a lot more like a book. The idea of being able to browse the bookstore and download a book anywhere was very appealing back in 2011 and I forked out extra on 3G. I've never used it. Equally I have almost never browsed the Kindle Book Store from the actual Kindle, preferring to use the website instead when I'm at a computer. A physical keyboard may make more sense to regular note-takers, but for me it has been largely redundant and on the rare occasions when I have used it, found it to be a pretty fiddly experience. The PaperWhite is a much less busy looking device, which I prefer. After all, I just want it to get out the way and let me focus on the prose. The touchscreen keyboard, when needed, is responsive and certainly up to the task of punching in a book title search from time to time. The Paperwhite's screen is improved over the Keyboard's, but only marginally. The light is handy though. E-Ink screens look much more like paper than traditional LCD screens and are comfortable to read from, even during longer sessions. They also work great outdoors, which is essential if you want to continue to enjoy a book on the beach. The one compromise is that the screen refresh process that the Kindle has to go through to take you to the next page can be a little jarring as it appears to flash black and white before you see the new text. I think rather too much fuss has been made over this. I can imagine when the book as we know it was invented, there were people indignantly hanging onto their scrolls citing the fact that page turns in themselves got in the way. Whether or not the flash of the page turn bothers you (I never noticed it after a few hours of reading), the PaperWhite gets through this process significantly more quickly, which can only be a good thing. I admit, I could have saved myself some money and bought a basic Kindle. The difference between £59 for the basic and £109 for the PaperWhite did seem a lot for the benefit of a built in light, but I liked the idea of improved contrast and better low-light reading. In the end I waited for a special offer and paid a more reasonable £30 premium to jump up the range. After a month of ownership and a couple of books, I can report that the extra spend was worth it. I never found the Keyboard screen to be anything less than perfectly readable, but the lighting in the PaperWhite increases the comfort in all situations and makes low light reading possible, and pleasant, in situations where I would have previously had to search out an external light source or switch to my mobile phone. One thing I've really enjoyed since leaving paper books behind is being able to read in bed without constantly having to change position as I turn the pages. I've also read some pretty epic books in recent years and the removal of the bulk has also been a good thing. Moving from the Keyboard to the PaperWhite has seen the weight drop from 247g to 206g, which sounds a lot but in practice, both were always easy to hold on to and comparable to a typical paperback fiction of the dead-tree variety. With the e-book reader, Amazon have tried to innovate over as well as replicate the best of the traditional book reading experience. My Kindle Keyboard had an onboard dictionary, highlighting and note-taking abilities and I could share these and book completions over the major social networks. There were also 'experimental' features like a (terrible) web-browser, (pointless) MP3 player and (painful) text-to-speech. Suffice to say, beyond a bit of investigation, I've never used these features in anger. 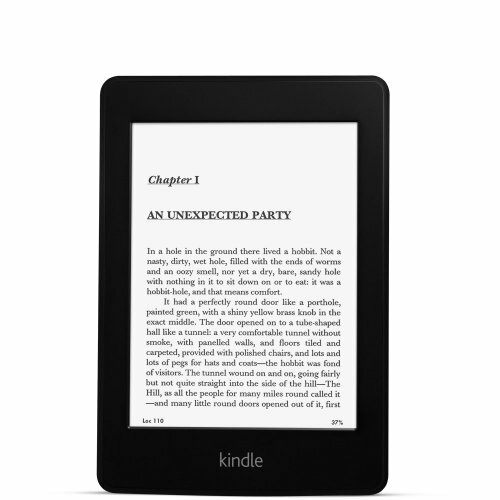 With the PaperWhite, Amazon have continued to build on this by adding a vocabulary builder (automatically stores words you've looked up in the dictionary and makes flashcards for you to use for personal development) and X-Ray, which allows you to dig into a page, chapter or whole book to further explore characters and themes. Whilst it's hard not to sound a bit vague when describing X-Ray, I've found I'm using it quite a lot. I'm reading a book that has several plot strands and a lot of characters. Sometimes when coming back to it after a bit of a gap, X-Ray has helped remind me who characters are when they reappear and so I've not lost sight of the subtleties of the plot. Not every book is enabled for X-Ray, but it's definitely useful and not just for bookworms. So I like my new Kindle. A lot. The Kindle has evolved into a form that will be hard to beat and that light has changed the way I use the device over its predecessor and the new covers, although expensive really make you feel like you're holding something nice in your hands, which the paper book always did too. Yet, I know that i really wanted, and expected, the Keyboard 3G to last longer than two years. The mild evolution of the e-book reader over the last few years is not a big leap and for all the extra functionality, 99% of the time I just want it to show me the pages of my book. If we really must change these gadgets every couple of years, when the PaperWhite breathes its last breath, I may look again at whether Amazon's way is the only way to get my book fix.